I am Union. I am Sportsman. I Belong. If you’re a hunter or fisherman, these are more than just words…they’re a statement about who you are and what you believe in. They’re just one reason why you belong in the Union Sportsmen’s Alliance, the hunting and fishing club exclusively for union members, retirees and their families. Now you can show the rest of the world that you are a Union Sportsman with a selection of USA-branded clothing and gear available on USA’s brand-new online store. 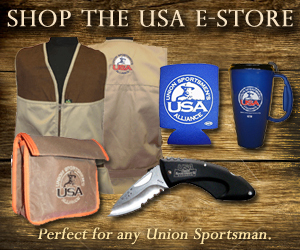 If you’re already a USA member, you received the USA-logo Buck knife with your membership. Now you can buy a matching one for your son, daughter or hunting buddy. If your shooter’s shirt has seen better days, you can replace it with a USA-logo version. And your favorite cold beverage will taste a little better in a USA koozie. Check it all out at the USA online store and watch for the lineup of t-shirts, sweatshirts and other outdoor accessories coming later this spring. Gear up and get outside!